Crown counsel has approved charges of animal cruelty against Duncan residents Norman Modeste and Patrick Edwards following a BC SPCA animal cruelty investigation. 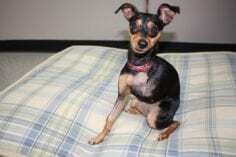 Princess, a miniature pinscher, was alleged dragged behind a truck and left for weeks without veterinary treatment for a broken jaw and fractured leg. BC SPCA constables attended to the injured dog in August 2010 after receiving a call about an animal in distress. Princess was cared for by staff and volunteers at the BC SPCA’s Cowichan Branch in Duncan, where she recuperated after having surgery to remove her left front leg. She had since been adopted into a new loving home. The BC SPCA conducts nearly 6,000 cruelty investigations a year and is reliant on donations from the public to continue its work. Your gift can support these investigations and help bring abusers to justice. Please donate today. 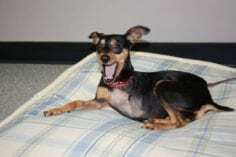 Photo caption: Princess, a miniature pinscher, was allegedly dragged behind a truck and left for weeks without veterinary treatment for a broken jaw and fractured leg.